I rely on critics for my movie choices, I admit. Without them I'd never have even gone to Tarantino's latest, which as time passes, I'm coming to consider the best movie I've seen in ten years. Thanks to A.O. Scott and others I never paid a red cent to see any Michael Bay orchestrated machine transform, and then of course explode, on screen. I didn't watch some stinky Matrix sequel either (not 2 or 3). That said, sometimes critics don't have a clue (and that goes for this critiquey critter too, I'm sure). 96% of the 'Top Critics' at Rottentomatoes.com gave the red tomato (ie. 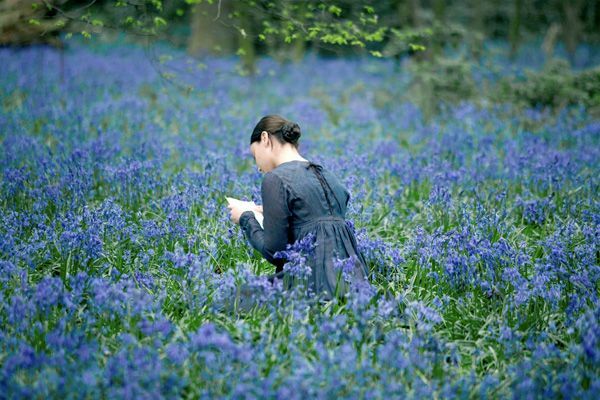 the thumbs up) to Jane Campion's ("The Piano") latest film, "Bright Star." My trusted mate at the NY times loved it, calling it "romantic in every possible sense of the word" and for a hopeless romantic of a movie watcher like me, you'd think that would signal the movie of the year alert. Instead I find myself saying, wtf! It's pretty, I'll grant you. Very, very pretty. And I suddenly gained an interest in seeing "The Piano" because my ever-perceptive wife LOVED it and my painterly friend Rosette LOVED it and because visually Campion is clearly masterful, and because I'm assuming her earlier film had something resembling a compelling story. "Bright Star," unfortunately, does not. A love story needs tension for it to work. The riveting tension, say, of that first meeting (no such scene in this film) or the unbearable tension of not being able to be together, which this film doesn't have nearly enough of. It had some beautiful readings of John Keats' poetry, though. Got me interested in picking up a book or two. So I guess it can't be all bad then, can it?